Kew Palace, which stands in the world-famous Royal Botanic Gardens in south-west London, is Britain’s smallest royal palace and the third building to bear that name. Built in 1631 as a merchant’s house, it later became the home of George III, Queen Charlotte and their large family, and a private place of recuperation for the so-called ‘mad’ king during his illness. Around the palace, the eighteenth-century royal pleasure grounds gradually evolved into the world’s centre for botanical study, shaped by Charles Bridgeman, ‘Capability’ Brown and others, and adorned with important garden buildings by William Chambers. Susanne Groom is a consultant curator at Historic Royal Palaces, London. 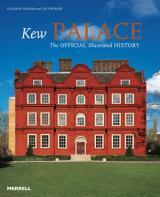 She is the co-author of Kew Palace: The Official Illustrated History (Merrell, 2006). Lee Prosser is Curator (Historic Buildings) at Historic Royal Palaces, London.